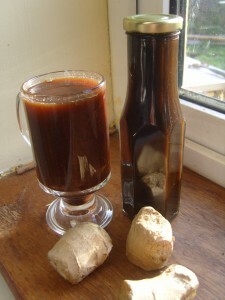 In the bottle -the complex syrup. In the coffee mug- the easy syrup .Notice the colour difference. I’ve been trying to make my mid morning coffee a bit more exciting for the last few months. 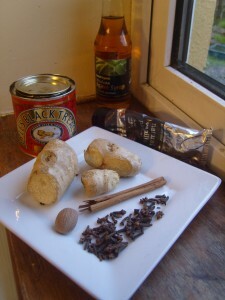 Mostly by adding natural vanilla bean paste and muscovado sugar -with the occasional cinnamon hint. I really don’t like coffee syrups as they are way too sweet for my palate and a bit artificial flavoured. I keep looking at the bottles in the store going- somedayI really need to make my own. Today is that day. Instead of filling out a scholarship application,delivering jars or any of the list of tasks given to me by the sister for her wedding I spent the morning playing with Gingerbread Syrup recipes. Procrastinator extraordinaire -thats me. This morning there was a tweet about someones recipe for making your own gingerbread liquer but since booze in my morning coffee is not an everyday occurance I figured I’d try making a non alcoholic syrup. 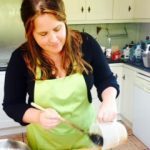 I found a bunch of recipes and dismissed them all to make my own. Here’s the recipe in progress. 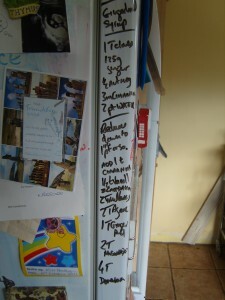 All recipes in my house get written onto a clean spot on the fridge until we’ve finished tweaking them and then they get committed to paper. Heaven help the helpful person who decides to clean the outside of my fridge before the recipes are all taken down (Mike periodically takes pictures of the fridge just in case a new fab recipe would dissapear). Whizz up the gingerroot with the cloves and cinnamon stick in a food processor(grate the root if you dont have one and just break up the cinnamon stick) I left the skin on the gingerroot as its being filtered out anyway. Put these spices in a big pot with 2 pt water and bring to a rolling boil and boil for about 15 mins until the ginger has lost most of its flavour into the water( pull out a shard of ginger and taste it). Remove from heat and strain through a fine sieve, a jellybag or a coffee filter. (If you use a paper coffee filter run some boiling water through it before you use it to get the papery taste off it) . You should have about 1 1/4 pt of liquid . If less add more water , if more you may have to cook the syrup for longer. Then add vanilla , ground cinnamon and ginger, mollases, sugar, agave,and the two cardamon pods (you can fish the cardamon out later). I added the ground spices now because they would have been strained out by the coffee filter and I want them in the finished product. Cook all of this up for about 10 mins, stirring occasionally, until it gets syrupy and starts to coat the back of a spoon. It will boil/foam up so use a big pot. Remove from heat and pour into sterilized bottles. used Agave syrup in the recipe to reduce the refined sugar load in the gingerbread syrup but since Im not used to working with it it Im being sparing and only adding a bit. I may add more next batch. If you hate Mollases leave it out of the recipe but it really does give a fabulous underlayer to the syrup. If you don’t have muscovado just use normal brown sugar. If you hate all brown sugar just use granulated sugar. Im thinking that next batch I’ll add the rind and juice of an orange to the whizzed spices to make Orange Gingerbread Syrup. The spices will settle out in the bottle just give it a shake before using.Keep it in the fridge and use within 3 weeks or so. So first I made this with no brown sugar(to be healthy) and felt it was too bitter, thought I’d over cooked the spices and was going to throw it out. But I found and tried a different easy recipe which made me realise the only problem with my origional was just not enough sugar . Added the sugar and now its fabulous (although now not a bit healthy). 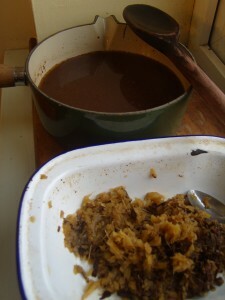 Heres the simple recipe From Penny Golightly on the Domestic Sluttery blog . Its a nice fast recipe and with a tasty result but the more complex recipe is well worth the effort as it is a multi-layered joy. Heat the whole lot gently in a saucepan until all the sugar has dissolved. This will take less than 5 minutes. Give it a good stir, remove from the heat and allow to cool. Fish out and discard the cloves, if you’re using them, then pour the syrup into a clean jar and cover tightly. Seems very nice… isn’t too sweet? Its strong enough that you can use it sparingly and avoid your coffee getting sickly sweet.